As a kid, I would often accompany my mother to the local grocery store and “help” her pick out groceries for the upcoming week. I say “help” because what 7-year-old child cares about anything other than Cap’n Crunch and Gushers fruit snacks? (Now you know two of my weaknesses. Use that information well.) Let’s be honest, I pushed around the always-unwieldy shopping cart—which was taller than my head until I was a moody, pimpled preteen—and tied plastic bags with disgusting green foods inside that my mom made for dinner—what were they? vegetables? yuck—because of one thing, and one thing only. The candy bar selection at the cash register. Does anyone remember these little guys? From the moment my innocent 7-year-old eyes fell across the fun and quirky turquoise packaging at the cash register, I was in love. It was fate, without a doubt—the first bite sent me skyrocketing into candy space with its crunchy, chocolatey outside coating and its crispy, cereal-like center. One package was never enough. For seven long, horrible, painful years, I lived my life in loathing of the other much more inferior M&M’s: Milk Chocolate (ugh, come on, if you actually seek out plain M&M’s, you’re the most boring person in the world), Pretzel (is this supposed to be some replacement for my beloved Crispies? that’s a sick joke), and Peanut (okay, wait, no. I actually enjoy Peanut M&M’s. But pretend like I never said it). There was always something missing on the cash register shelf without that obnoxiously blue little baggy. So the story actually goes like this: Ella and I were en route to our friend Lena’s dorm, where we were meeting up with some people to attend a French rugby match. We stopped in Monoprix with the intentions of bringing some kind of snack to the get-together, so naturally we hightailed it to the candy aisle where Ella found herself engrossed in the M&M’s selection. Oh, they’re good. You should get them. Here, almost 21-years-old, standing in the middle of a Parisian grocery store, I had completely forgotten my whirlwind-romantic past with Crispy M&M’s. Ella picked up the turquoise bag (and another bag of strawberry-marshmallow puffy candies, because evening-out that savory chocolate taste with some fruity sweetness is a necessity), and we walked to the cash register. And that’s where it hit me. “OH, MY GOD,” I moaned in loud English, borderline offensive in the chic Parisian store. “THOSE ARE CRISPY M&M’s.” Immediately, like a cheesy montage of cutesy-dootsy pictures at a couple’s engagement party, childhood memories of me holding my beloved blue package of Crispy M&M’s at the cash register of Genaurdi’s family supermarket flashed across my mind. And it was beautiful. Those seven years without my M&M soulmate were worth the loneliness and suffering when we finally reunited in the cafeteria of Lena’s dorm building. Same soft crunch, same sweet taste, same melt-in-your-mouth goodness. I know I ate at least half the bag by myself because I just could not get enough. I swore to myself after coming to Paris that I wouldn’t buy any mainstream American brands from the supermarkets here and bring them home to the states. But when you find someone something you love … you can’t ever let them go. So here’s to a suitcase half a pound heavier because of a little turquoise bag. Photography by Google Images and Ella Pennington. Tags: American, brand, candy, crispy, france, grocery store, M&M's, Mars, milk chocolate, monoprix, paris, peanut, supermarket. Bookmark the permalink. 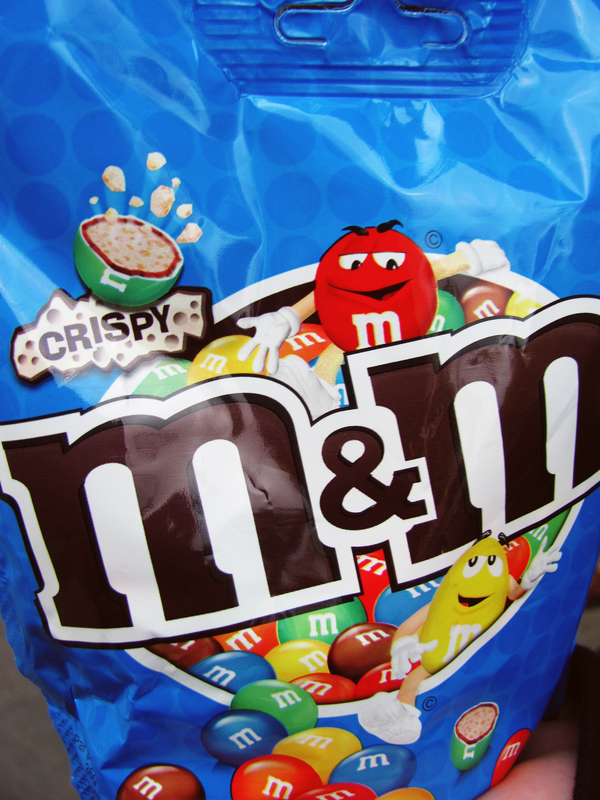 You are a girl after my heart, Crispy m&ms were so good. I’m happy that they still exist somewhere in the world! Time for them to come back to the U.S.!